My first digital camera was also a logitech. And it could take photos and videoclips. It didn't have a display for review. Cheers and good luck with the new blog ! p.s. Hi Ben, are you on twitter? Got myself a Logitech Footman in local flea market with dock. I don't have PC or even old PC to test it but it beeps when I press the shutter button (after I changed the battery with newer). Tried to connect the serial-to-USB to my modern Mac but no communication. Will find an old PC to try it. Very cool! 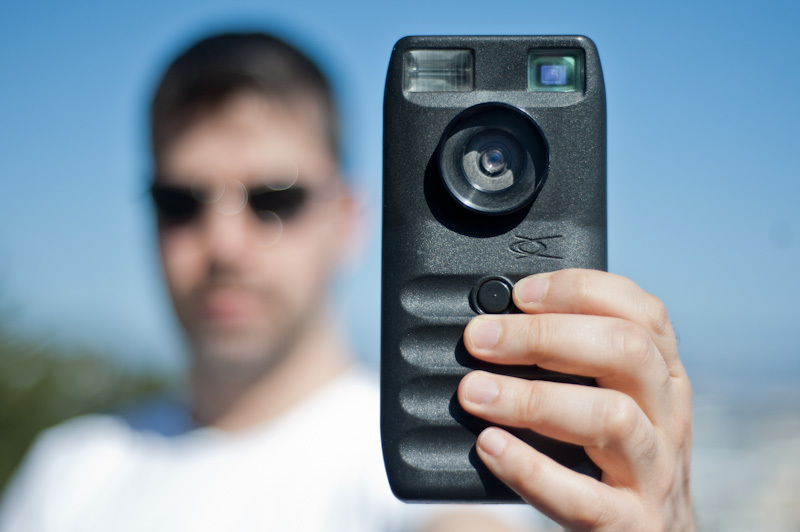 Looks like yours has the neutral density filter as well. Let me know if you're successful in getting it connected to a computer. very cool writeup! Thanks for sharing your experiences with this camera. The oldest digital camera I have is the Apple Quicktake 100, which is relatively easy to find in ebay. While cleaning up our office before we move to a new building, found the same camera (Logitech) in a cupboard with the 1.44 disk with software. I will need to contact you if i can find a computer with a FDD. Using Macs at home and no floppy drives at work. Thanks so much, Arjuna! Here's hoping you can find a drive. If not, and you'd be willing to mail the disk to me, I'd be happy to copy it myself, then mail the original back to you, and pay shipping both ways of course. I also understand perfectly if you'd rather not do that. Thanks for posting! Hi Ben. I came across your site by accident and realized that I have one of the white ones (Logitech fotoman - still in the box), I have to go dig it out of the other room, but if it comes with software, is it compatible with your model? If so, I'll be glad to burn you a copy. Let me know. I've been collecting these as well - haven't found the dycam yet, but the logitech's seem to come up on ebay now and then. Was wondering if you've been able to get a hold of the software tho? if so, I would love to get a copy from you if possible. my email is ew.pub[at]anyorganization.com. hope to hear from you. Google can do a lot more for you than spit out random search results, you just need to know how to use it properly. Owning a Dycam Model 1 camera is actually part of my bucket of wish lists! I just do wonder if there are still stores or dealers out there where I could buy this one. For a moment there I thought I was looking at an old light meter or something you get an old electronics shop. That camera has got to be quite the find. Too bad you can't get the pics out of it. Pricey much, especially those times when it was first released! I think there are colored films already in the 90s, I wonder what happened to this one? Well, it's the starting point of digital cameras, Dycam Model 1 is excused. Still, I'd love to see one. Years ago,, I contacted Dycam about there ag camera system as I knew that infrared data from a 35mm yielded some data,, but just could not sort it out. A fellow named Steve "Herold" (sp) was the top skunk works person at the time and head person for the near infrared camera based off the model 4 was in charge. Steve and I worked together for over a year as I was about the first real farmer to get his hands on this tool.. I even got a para plane to do the photos to capture 100 to 200 acres with 1 image. The results and useable data was and still ahead of anything else I have ran into,, even tho its been over 10 years ago..
Steve had his own camera image program that would down load the images and then apply a color coded value over the field areas with the veggie health index,, or BRIV.. I could see a area in a 100 acre field the size of a bathroom that had a insect problem or soil health issue with this enhanced digital image..
As the demand picked up Dycam gave me the 48 state sales agreement to sell the camera systems.. I busted my rear for them and ended up at a ag show trying to show off the camera system and what it could do for farmers with zero support from the home company.. Just a pile of images and stories about each in a booth and table.. I was beyond boke at the time raising 6 kids and paying off my x wife and buying into a farm all at the same time. That and I broke a disc in my neck and made travel near impossible,. There was a fellow in the booth next to me at the ag trade show that looked and acted like a reject from a low ball used car sales lot that would run down my efforts at any point it looked like I had someone who wish to hear my story. What ended up,, this jerk contacted the company and somehow won them over and they signed him on and took over my sales area and nil and void my contract by changing the name of the company but keeping the Dycam site and name up but no support or sales. They renamed the outfit, TetraCam.. I still use my old model 4,, and it still performs its magic to spot crop health issues for me and our farm.. Matter of fact,, I am just about ready to shoot all our 2014 wheat crop searching for weed pressure areas.. I actually have two of these cameras that were given to me when we cleaned up the office. I have the white one and the grey one, software and all attachments along with the manual. It's in the original box. Can anyone give me an idea on how much these would be worth today. Hi JP, I got mine a couple years ago for $40. But more importantly; do you have a computer with a disk drive that can accept those disks? I can step you through making images of them for those of us missing the disks can download. My father John Edling started Dycam in 1988 with a friend Jon Barrett. If anyone has any questions or would like support please email me at bedling1@gmail.com and I will do anything I can to help. I'm fairly sure that this is not exactly what your father said. My plans for Dycam were fairly far along when John and I met again in, I believe, Logan airport. Your dad and George Ismael did not join the company until after Scott Loftin, Steve Heinold and I had completed the design of the Model 1 and sold a license to Logitech. The idea and start-up money was mine, and I was Chairman and President for the first five years. John Edling's critical early contribution was convincing me to do the company in California so that he could talk Scott, Steve and George into joining the company. I wonder if Kodak ever noticed that the Dycam 1 was intended as an homage to George Eastman’s Model 1. Both cameras had exactly one button and no removable media. The Dycam Model 1 was announced almost exactly 100 years after the first Kodak camera. I don't know if you will ever successfully find software to download images from the Dycam Model 1, but you could try going to tetracam.com and giving them a call. 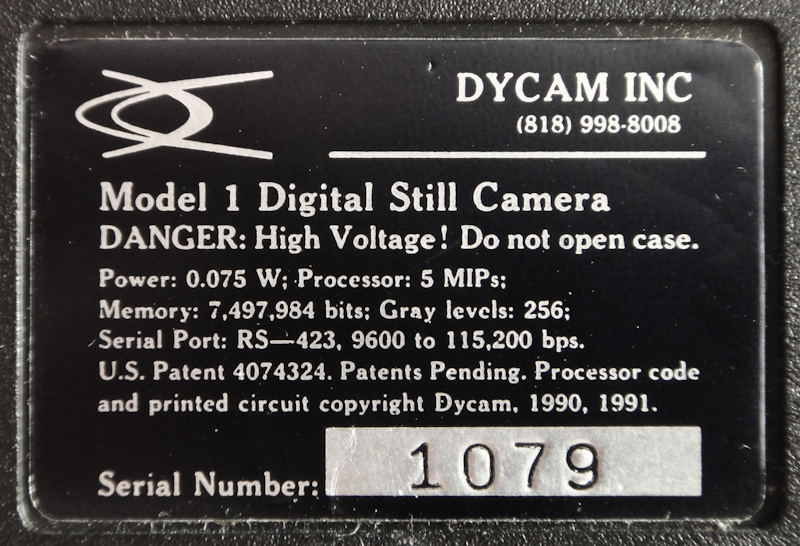 Dycam was run by some folks who now run Tetracam, and the Dycam brains are still there, after all of these years! Good people! There is something very nostalgic about you writing this up and showing off a working Dycam Model 1, and so maybe they would be interested in helping you. Sorry I did not take the time to read all the way down this wall of responses, but it looks like another anonymous (possibly Jon Barret) cleared up some possible misinformation that I and others have put forth here about who was and wasn't involved in the Dycam product. I bought a Dycam Model I in 1991. I wrote to Dycam and received the developer's kit. As I recall the commands to the camera began with the character followed by a capital letter. The camera would then send info down the serial port. If I recall correctly the command S would reveal the status of the camera. Hi, I have a Dycam model 3 in your interested. Hello there. Do you still have the Dycam 3? Just got on here, funny you should ask, just pulled it out.